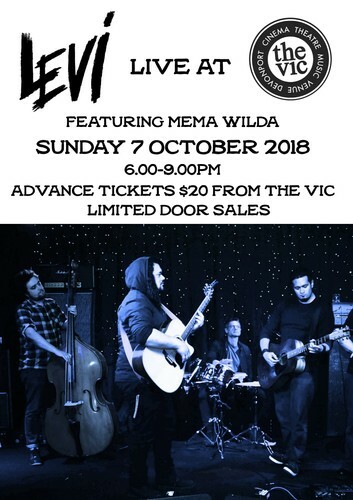 The Levi trio consists of acoustic guitar, cello and cajon/percussion performing a harmonious, classical twist on folk music with a very gentle infusion of rock. From relaxed, heart-warming, thought provoking tracks to more upbeat, catchy numbers, Levi's music is unique and diverse and delivers a message of self awareness and humanitarian compassion. This genre-spanning ensemble makes for a well-crafted show of original tunes which will entertain people from all walks of life. Opening the show will be singer/songwriter Mema Wilda with acoustic guitar and percussion. Mema's beautiful, soulful music is inspired by her experiences of love, positivity, dreams, fear, Mother Nature and all the other emotions and journeys we could all relate to. Pre-sales available from The Vic or door sales on the night.